Commercial 3D printing. A lot of you might think that 3D printers are only exclusive for “hobbyists.” The truth is that 3D printing has penetrated the commercial, industrial, and even medical fields. 3D printers have become a very indispensable tool in getting things done faster and more effectively. Let us take the case of Boeing and Airbus, two of the world’s biggest airline manufacturers. To streamline their work, they have incorporated 3D-printing when manufacturing certain aircraft pieces. In the aerospace realm, a designer used a 3D printed satellite specimen while making a certain spare part. It was eventually launched in space. In the world of medicine, 3D-printing has been used to print exact copies of tumors and body parts that made the work of surgeons and physicians a lot easier and more convenient. In fact, according to Peter Weijmarshausen, CEO of the 3D printing powerhouse Shapeways, 3D-printers have the capacity to print on concrete materials. That means it won’t be too late before we can witness gigantic 3D buildings getting printed, before the foundation is laid. One mainstream development is the printing of basic types of semiconductors. Weijmarshausen projects that it won’t take longer than five years before the first of its kind 3D-printed circuitry will grace the market. At this point, it would be easier and faster to print the likes of am MP3 player. What’s great about this is that the made-to-order process boosts a company’s productivity and efficiency. These commercial 3d printing applications make it easier to manufacture and sell something, using 'samples', where eventually, you could get the feedback you want. If you think the feedback isn’t that great - or there are flaws in the finished product - then you can just improve your work through another (inexpensive) test run. No sort of "inventory” is involved, which means that changing and improving your work is made faster and a whole lot easier. "You can see how powerful this new technology is … it has delivered crazy, exciting things, things that I’ve never dreamt possible," boasts Weijmarshausen. 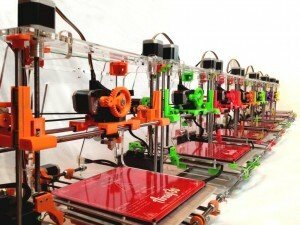 Although a lot of things can be printed using 3D-printers, you should remember, however, that there are also limitations. For example, size should be given attention. Usually, 3D printers are as expansive as a large cabinet. What this means is, right now, it’s only possible to print something the size of a fridge, but no bigger. Another limitation is the materials. However, 3D printing technology keeps on developing, so you can expect more base materials and even multi-material printing as time moves forward.